I thought you would enjoy seeing my Family Tree Gallery. This was actually at its first stage. Today it is much larger. As I come across an ancestor (grandparent), I add them to the wall. And there are quite a few now! This gallery is in a long hall in our home. And it contains photographs of both my ancestors, and my husband's. I always feel great comfort in passing the photographs as I walk by. It's as if they are saying, "I'm so glad you remember us!". 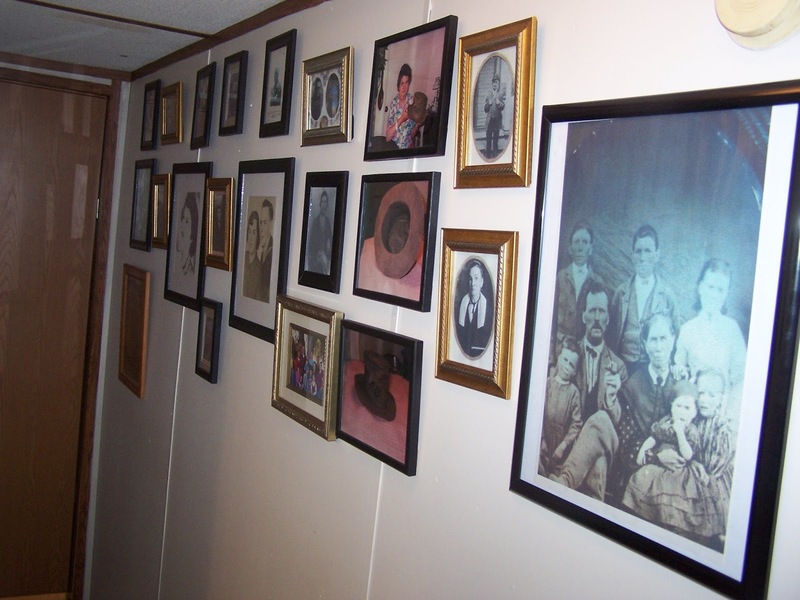 Do you have a place in your home where you hang ancestral photographs? I thought I would show you a photo of me and my siblings, and our parents for this Sibling Saturday. 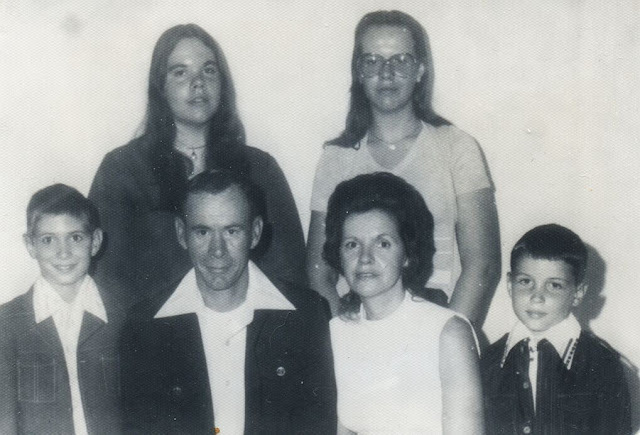 Front row, left to right: David Lawrence Beane, Walter M. Beane, Lois V. Dreher Beane, Jeffrey Scott Beane. Back row, left to right: me, and my sister, Velleda "Eydie" K. Beane. This photo was taken in 1977, just a couple of weeks before I left for Texas. 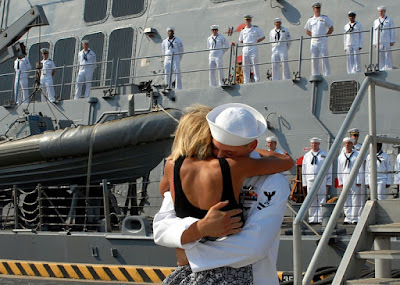 I was moving to be with my husband, who was in the Army. I love this photograph. My parents are so young here. (They were only in their 30's.) When I remember my Mother (1938-2015) this is how I remember her. She was always such a pretty woman. I am the eldest of the four of us siblings. Then my sister, then David, and the baby is Jeff. (I think they were like 8 and 6 at the time. And Eydie would have been 15. The photograph was taken at the only local photographer's. He still used glass plates that he left in the sun to develop photographs! He hand colored the large photograph, but all of the smaller ones were in black and white. I can remember being so fascinated by the process. So there you have us for Sibling Saturday. And now you know what we looked like as family when I was a teen! If you're like me, you hit a brick wall in your genealogy research now and then. It's just been lately that I discovered the many genealogical ideas, links to websites, and templates available for just a few moments of your searching time. On several of these searches, I have found a web site that I didn't know existed. I found templates that are for more sophisticated than what I have been using until now (most of my templates are those that came out in the '90's and are so antiquated, and unable to use your computer to fill them in). I have fallen in love with Pinterest. 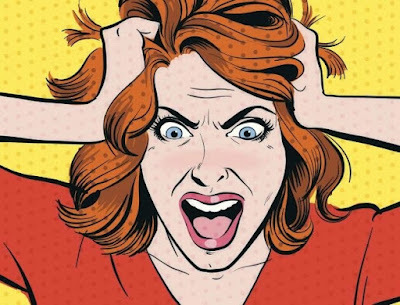 Here you will find so many helpful articles that you can read for weeks and never read the same article twice! As well as photographs, and ideas for getting young children involved in genealogy! You are also given the option of following several of those who post on Pinterest. This means you will receive notification when someone you are following puts a new item on the site. And that can mean a breaking through of that nasty brick wall sometimes! I highly recommend adding Pinterest to one of your genealogy sites bookmarked on your computer. At the very least, you can find some inspiration for either where to look next, or in your filing system! 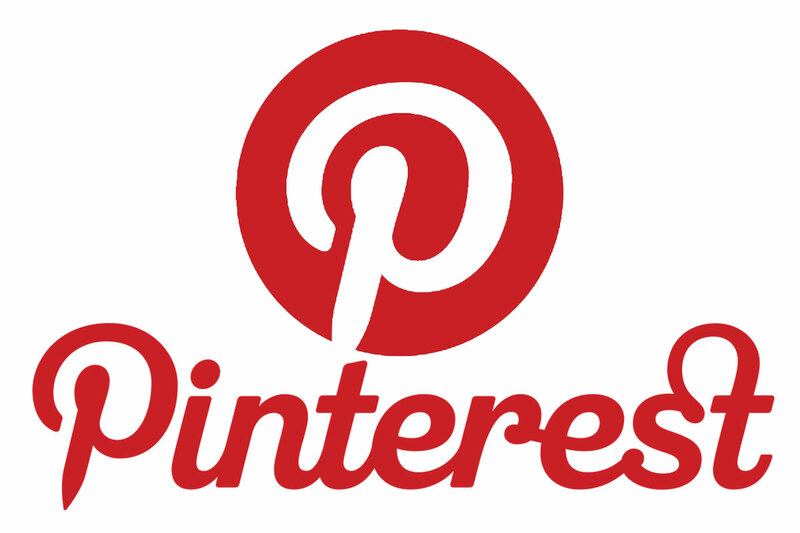 Pinterest is a free program, and you can download the free app on your smartphone, which means you will be notified of new pins even earlier! So, sign up today, and in the search function, simply type in genealogy. You'll see what I mean! I highly recommend adding Pinterest to your genealogy research bookmark. If you know what this place is called, or where it is, please leave a comment. If you don't know, then check back tomorrow for the answer. ****HINT: Nickname: Underground White House. If any of the Beane family members receive an email from a Frank Bradley his email is frankbradley7122@gmail.com, DO NOT engage with this man! He is a bookkeeper who found out some funds in an Equatorial Guinea account are about to revert to that country as a certain man with the last name of Beane has left funds in the bank there and died intestate. I checked and the funds are very real. But when this man contacted me, I did what I do best, genealogy research. This Beane is NOT, and I repeat, HE WAS NOT, related to our line of Beane's. But this man Frank Bradley will hound you to death! If you receive an email be smart and block him. He likes to mark the email as Urgent, and two of my email accounts let it through. Again, the deceased man who put the funds in the bank is NOT related to us. He is from another Beane line. Found on Pinterest.com No credits given. Well, it really isn't a tip. I came across this lovely poem on Pinterest. The best I can find, is that it originated at scrapbookinglife.com which seems to be a non-functioning site. But I couldn't pass it by, because it is so lovely. 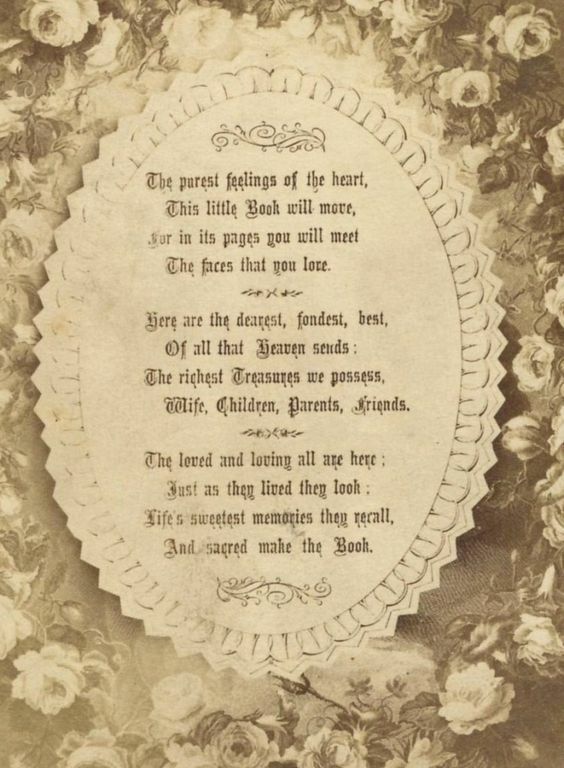 My tip is that this would make a lovely first page in your ancestry scrapbook if you are using one. 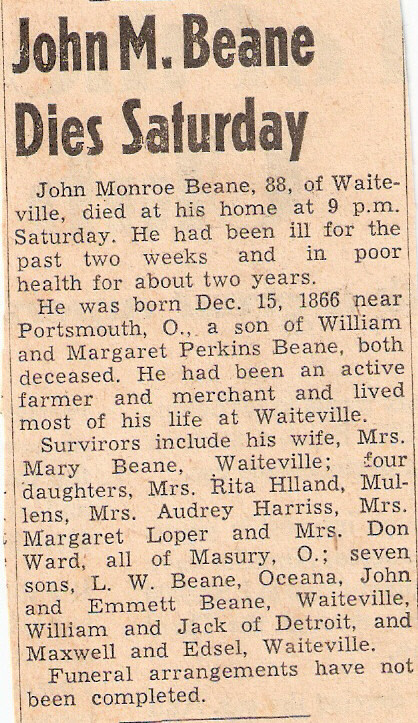 The above is my Grandfather's, John Monroe Bean, Sr.'s, obituary. He passed away on Saturday, April 10, 1954 at 9 p.m. I won't try to transcribe it, as I believe the scan is clear enough to read on its own. My Grandfather was 87 years of age when he passed. 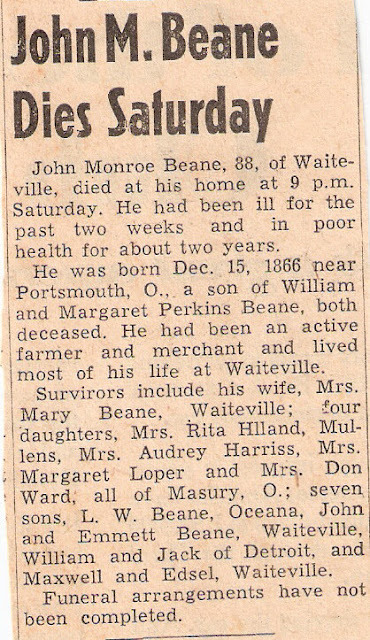 Born on December 15, 1866 in Ohio (this lists him born near Portsmouth, and I've seen it listed as Cincinnati), he was the youngest son , and the 6th born of 8 children to William M. Bean, Jr., and Margaret Smith Perkins Bean. His Mother, along with two of her brothers, crossed Union lines in an oxen pulled covered wagon with 3 small children, to meet up with her husband, who was a spy for the northern army. She had two brothers who escorted her and the children on the dangerous journey. After the war, the family stayed on in Ohio for a short while, and this was when my grandfather was born. When he was but a few weeks old, the family was once again pulled by oxen in their wagon, and made the journey back to the hills of West Virginia. It was the dead of winter. And it was a particularly cold winter. My Grandfather, whom I have been told wasn't of tall stature, as all of his sons were, stated that because he was a newborn, and they travelled through the cold, "the cold weather stunted" his growth. It was so cold, that my Great-Grandmother Margaret, placed the baby inside of the bust of her dress so that he would stay warm from her body heat. Grandfather was first married to Blanche Uremia CROSIER (1875-1902) on 25 June 1895. Blanche and Grandfather had three children. When the youngest was born, Blanche contracted tuberculosis. Her daughter told the story that her mother was given creosote to treat the ailment. She died soon after, leaving Grandfather with a 6 year old, a 3 year old, and a 4-month old baby. As my Aunt Rita told it, the baby was given to his brother's family for a while, until she was large enough that Grandfather could take care of her. Aunt Rita stated in her memoir that they "batched it for a time". She stated a neighbor lady came in to braid her hair once a week. Then in March of 1907, Grandfather left the children for a few days. 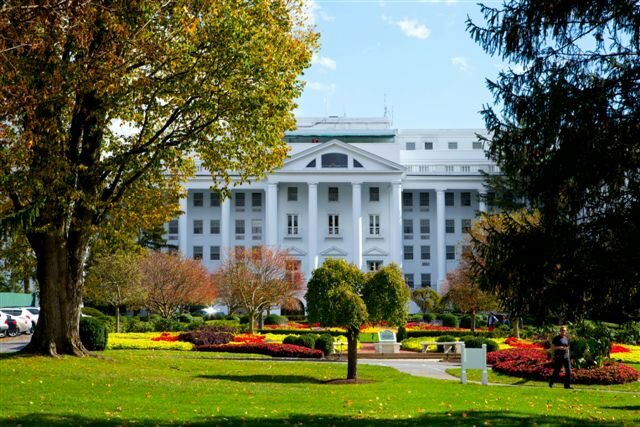 When he came back home, he was married to Miss Ada L. Burdette, of the Greenbrier Burdette family. (It is said they apologized to the children for having been so long in coming home, as Miss Ada was waiting for her false teeth to be made.) Grandfather and Ada had 9 children between 1908 and 1929. Again Grandfather was left with a newborn when Ada passed away from eclampsia just 5 days after giving birth. So the baby boy was sent to live with one of Ada's sisters. He came home to visit, but he stayed with his aunt until he was grown. On December 1, 1935, Grandfather married Mary Elizabeth Faudree, my Grandmother. Grandfather by now was getting on in years (he was 69 when he married my Grandfather), and my Grandmother was not so young either, she was 38. They had 3 sons. My Dad came along in 1937, another son in 1939, and the last child in 1943. The last child died in 1946 from a burst appendix. The final count was 15 children born to my Grandfather. All in all, Grandfather buried two wives, and four children before he passed. Grandfather suffered a stroke, and was unable to do much when he passed away in 1954. During his lifetime, my Grandfather was a Deputy U.S. Marshall, to his father, who was a U.S. Marshall. This was before he ever married. They would travel by horseback from Waiteville, Monroe County, West Virginia, over into Pearisburg, Giles County, Virginia. There they would pick up a train load of convicts. They would march them from Pearisburg all the way to Ronceverte, Greenbrier County, West Virginia. That is roughly 50 miles. This took several days. In Ronceverte, they would all board a train headed to Charleston, WV, where the convicts were loaded onboard a boat and shipped to a federal prison elsewhere. At that point, my Great-Grandfather, and my Grandfather, would head back home. And he was a farmer. He raised beef, bred them, and them sold the calves in the fall for veal. 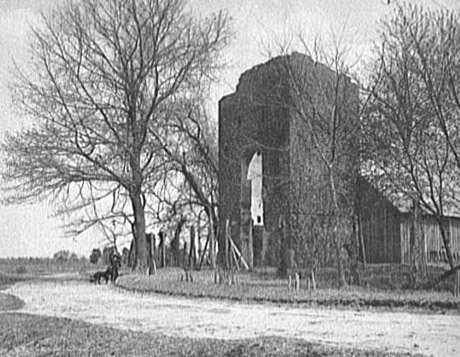 His final home was in Waiteville. He had purchased a home that was covered in board siding, but beneath was a log structure. The house had two rooms down and two rooms up. There was a small addition off one of the rooms downstairs. Here they put a wood burning cook stove. Later a refrigerator was added, along with a work table, and a couple of cabinets. Grandfather was laid to rest at Mt. Zion Union Church Cemtery, in Waiteville. My Grandmother was buried beside him. Labels: Amaneunsis Monday, John Monroe Bean, Sr.
Navy memories grow deep in me. See all of those men and women lined up on the deck? That is how they come into port. Sailors in their dress uniforms. And they were always at parade rest when entering port. It always amazed me at the accuracy of the timing of the ship's arrival. Mom always made sure we got there early, but almost to the exact minute, you would see the tugs boats come into the harbor guiding those megalithic beasts of ships safely to the pier. And waiting on the pier were the wives and children of the sailor's. There would first be the cry from someone, "Hear they come!" as the tugboat would come into view with the ship. The ship would be slowly guided by tugs and helmsmen safely into its slip at the pier, and the anchor would drop and the ropes tied. You would hear mother's telling their children, "Do you see him? There he is! There's Daddy!" We would be dressed like we were going to Sunday School! It was a special occasion. Our loved one was coming home from being gone for months at a time. (We once figured out that in my first 16 years of life, my Dad spent all of 18 months at home.) So, I really didn't get to know my dad as a real person (and not just Dad) until after I had married and he retired. But my Mom, bless her, she never let us go a night without praying for Dad when he was gone. She never let us forget that he was doing his part in the Navy during the Vietnam War. His pictures were placed all about the house. It was as if we knew everything about him, and loved him, but we simply couldn't see him. At that time, letters were the only communication we had with Dad. Yes, there was a time after the pony express when letter writing was still commonly practiced! No cell phones or computers! I know, I'm telling my age! I wish I could describe, so that you would understand, the excitement that filled the air as we waited for Daddy to disembark from the ship. I don't think a ship ever pulled into port that we weren't able to see Dad standing at the bow. We would wave and cry out loudly when we saw him. Mom would get all teary-eyed. And when they were finally released for shore leave, Dad would come bounding down the gangplank, and run right to us with arms open wide. "How's my girls?" he would say breathlessly to Mom, my sister and I. And then, just like in the photo above, Dad would suddenly grab Mom, and they would kiss. And I grew up knowing what love looked like. It was that breathless anticipation of waiting for your husband to come home! It was that teary-eyed look when you caught your first glimpse of him! It was that feeling that you have to run to get to your family, because you couldn't stand another moment apart! It was love! Mommy has passed on now. We weren't ready to let her go, but God knew it was time. And Dad, well, he's surviving. Every now and then he will get teary-eyed and say "Sissy, I miss her so much! ", just like Mom would say, "I miss your Daddy so much!" when we were little girls. And in my mind's eye, I can see Mommy standing on the pier waiting. She isn't alone. She has loved ones all around her, telling her to just be patient, cause the ship will be in shortly! She's waiting for him I know. And for my sister and I, and our brothers, and all the rest of us. She'll be there when the ship arrives with me one day. And I won't be able to hold myself back. When that gangplank drops, I'll come running to her with my arms open wide! And I'll be home. Where we'll never have to be separated again. Do you have a sentimental memory which makes you wish you could go back in time and relive? To experience it for the first time all over again? If so, please feel free to share it with us here. We'd love to see your experiences! This subject has been written on by genealogists around the globe, and many who are far more qualified than I. But I was wondering how many people have downloaded the app for this program, and have actually been using it to locate ancestors? At first I was skeptical of this program. I could imagine a large input of "You're related to..." and having no real basis for this. But having used it now for a few months, I am finding more and more honest to goodness ancestors than I ever would have found on my own! First, don't let me mislead you into saying that just because the app pairs you up with a celebrity or a friend and can "show you" your common ancestor, don't believe for an instant that it is correct! I have come across some "connections" that were totally bogus. First, let me start by saying this, years ago I put my family tree on Ancestry, and I was quite naïve. I gave permission to family members to add what they knew to it. Suddenly, it grew and grew to such a proportion I couldn't believe my luck! That is, until I started trying to find proof of certain individuals being in our family tree. At least after the first 6 or 8 months, I stopped having anything to do with the tree on Ancestry, except to make myself and my husband the only ones who could add to it. I have never gone in to clean it up. I wouldn't even begin to know where to start! The best that I could do is to delete it completely, and put the present tree there, with myself as sole administrator. However, I am so lazy these days, that I would rather family simply contact me and let me send them a copy of the researched tree. With all of that being said, there are some matches with the app that simply aren't real. 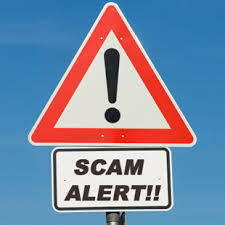 But of the over 150 people in the app, I have found less than a dozen that I have been able to disprove. And the rest, I have been able to PROVE. So, I would count that as a pretty good record! Those that are proven, I was able to prove my lineage back to the common ancestor, and then follow that ancestor's descendants forward to the person to whom I am allegedly related, according to the app. So, is the app worth the effort? Amazingly, I have to say yes! But, with the caveat that you don't take the app's word for the connection. Do the research to prove or disprove the common ancestor. 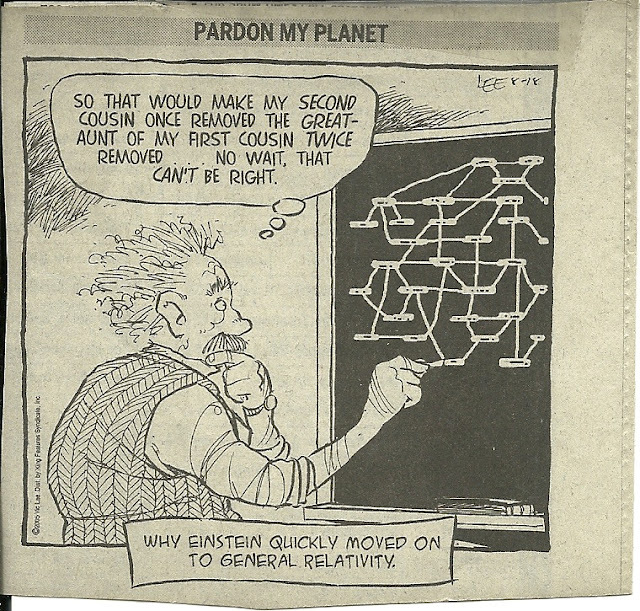 And the same to prove that common ancestor's descendant's to the person you are supposed to be related to. A few that I found I was supposed to be descended from: Adam (as in Adam and Eve). If the Scripture is correct, and I do believe it is, I'm pretty certain I am related to Adam, as are you, and you, and you, and well you get it. But proving that lineage? Well, where some people get this information is beyond me. 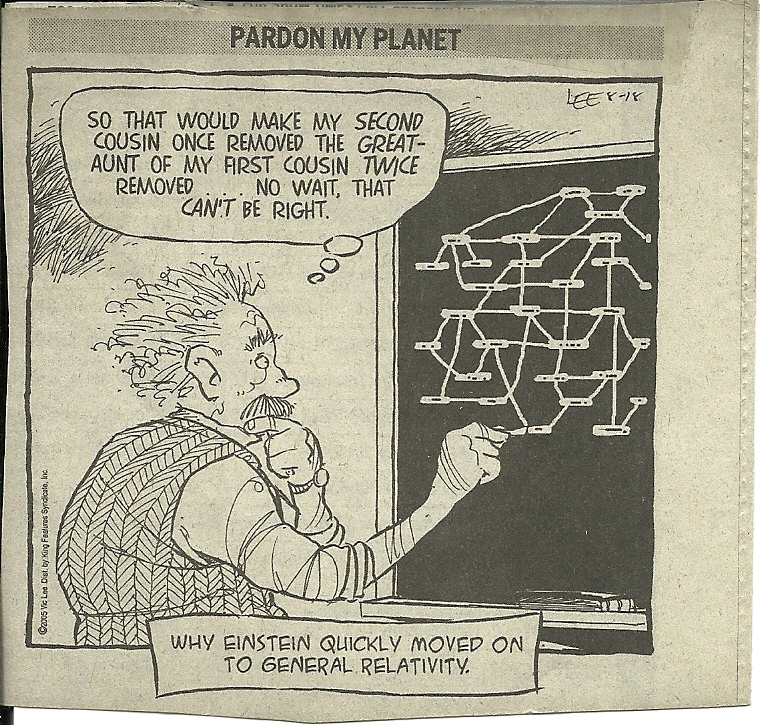 I mean do stupid people just sit around and play with genealogy like it's a game and think we are as stupid as they are? Okay, so I'll admit Adam is my ancestor, as is Eve. But the descendant's that run from Adam to me? I'm pretty sure we'll never get those birth and death records to prove or disprove that relationship! Joan of Arc: okay, yes, there is some French ancestry (a very little). However, as I recall Joan of Arc was 14 when she began her crusade, and died a virgin. And so, how is it she is my ancestor exactly? I don't think cloning was available then. (Is it now, for humans?) I think we can discount little Joan as being my ancestor. Queen Elizabeth I: Really? I mean, who on earth thought I was descended from Queen Elizabeth I? Related to, yes. Very distantly. (I mean very distant.) As in, if I was not descended from her father, how did they think I was descended from a Queen who supposedly never gave birth? So, you get the idea. There are going to be some real quackers in the mix. But for the most part, using the app can lead you into a whole new arena of searching for ancestors! And if you want to know if you're related to Brad Pitt, simply because your app says so, well, put some time, effort and research into finding out first if you are related to the common ancestor it names. And then, put a little more into finding out if you can follow that ancestors descendant line to Brad Pitt. Or Bill Gates. Or John F. Kennedy. Or Elvis Presley. Or even Donald Trump. It's worth the effort if you want a fuller, and more interesting tree. And it's been a blast so far. I look forward to the days when my iPhone does it's little "bing!" and let's me know another person I am related to. That means, I need to get done with my work (job) in a hurry that day, cause baby, I'm heading home to do some genealogy! 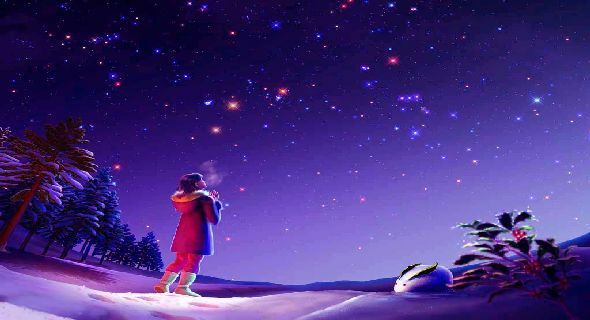 Have you ever wished on a star? On blown the small seed heads from a dandelion and made a wish? Perhaps pulled apart the wishbone of a chicken or turkey with a sibling? Or simply wished when you blew out a birthday candle? We have all engaged in making wishes at some point or other in our lives. Today I would like for you to tell me what your "genealogy wish" would be. It could be something really big and stupendous. Or something trivial. Let us know what your Genealogy Wish is! As for me, if I could make one genealogy wish come true, it would be to complete the trilogy I am working on of our family's history to give to my Dad now while he can enjoy it. Dad will turn 80 this year, and time keeps slipping away for so many of our family elders. I don't want to get it done too late. Well, that is my wish, plus.....find out where in the heck the Bean family tree goes prior to my great-great-grandfather William! Oh and....well, I did say just one wish, and I've only begun with the two I've put here! Tell us what your one genealogy wish would be! There are a few places in this world I would still like to visit before I give up on traveling altogether. And London is one of those places. 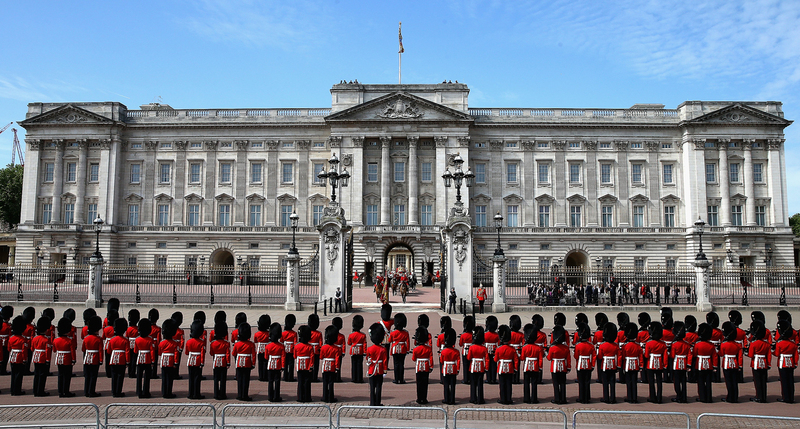 The photo above is taken from The Royal Portfolio, and depicts the Queen's Guards standing in front of the palace. And, of all things, I'd love to visit some of the homes, or sites of the homes, where some of my ancestors once lived. (We are talking about many hundreds of years ago with those!) However, some of their remains (the buildings and castles) still have old stones from the castles present. I would hope one day, before I leave this life to be able to go where my great-great-grandfather was really from. Of course, I would first have to discover where that place is actually! And therein lies the rub. It is like he was plopped down on this earth at the age of 12, as there has been no definitive proof of his birth prior to that time! And DNA has not matched us up with a recent (within 500 years) relative. A bit of a conundrum since there really aren't that many families with our ancestral name! Bean. Or its derivative. Well, we are plentiful in the sense that there are many Bean's, and some with very long histories. But our DNA has not matched up with any of them! Not a single one! Except for second cousins. Which, is of course, expected. But it is almost as if the Bean line just magically appeared with great-great-grandfather! But it is the women that our Bean men married that can give us our long, and varied, histories. Three lines, of which, have led us into royal ancestry. All of the English kind. And so, I would one day like to visit London. Perhaps when England's WDYTYA is taping an episode they might invite a certain American cousin (mwah!) to come and visit the ancestral places of her heritage! Well, who knows, a gal can dream big can't she? Where would you travel to if given the option of visiting a location that is tied to your ancestors? And why? Well it's been a VERY LONG WEEK. And yet, the week has only begun! As I write this, we are in the wee small hours of the morning, and I have to be up in a few short hours and head off to work. As I finished up tonight's dinner dishes, very late, because I fell asleep in my recliner before getting them done), I realized I had not written a single post for this week! So, here I am, at the last minute trying to get them done for the upcoming week. I want to thank everyone who has expressed their kindness when reading my droll little tales of my family ancestry. I rather find the stories of my ancestry quite interesting. And I try to put them out there for posterity. I feel like, 'If I don't tell the stories, then who will?' I would like to think one of my five children would be bitten by the genealogy bug, but not so far. So, for the sake my grandchildren and future great-grandchildren, they will find them here, and at our local historical society, who will receive all of my files when I leave this earth. So, while you are, perhaps, snug in your beds and dreaming of whatever it is you are dreaming of tonight, I will scampering here at the last minute, getting this week's blog posts out there for you! Here's wishing you all sweet dreams and a happy tomorrow! With Easter fast approaching, I thought it would be fun to take a look at my favorite Easter picture that my Mother took of me. I also carried my little Bible with me, which isn't in the photo. It was a hardback Bible with a painting of Jesus and the little children on the cover. My Mother taught me to read with that Bible. And Bible memorization was a HUGE part of my upbringing. 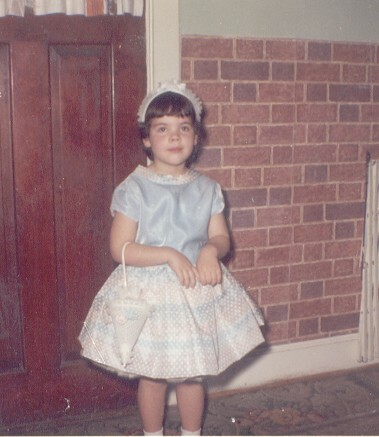 Each Sunday we were dressed in our very best dresses, shoes gloves. If I did not wear a fascinator, I wore a small kerchief looking cloth that was pinned to my hair (we were very strict old school Baptists.) In just a few short years (before 1970 I'm sure) we stopped covering our heads, and went without hats or fascinators or scarves. Times were a'changing. Mother always got us ready when we were small, and we would have to sit and wait for her to finish getting ready. Ever try to keep a 3 year old and 5 year old sitting still? Well, she would turn on the television. And in those days there were Gospel Singers on television before time for church. We would sit and sing along to the songs we knew. See, it really wasn't that hard to keep us entertained! Easter was always a fun time with my Mother. Daddy was usually gone (he was full time, career Navy, and was at sea more than he was ever home!). But Mother made it a special time for us. She always made up for Daddy not being there. Some of my fondest memories of my Mother when I was this age, was playing with Barbie dolls. Still a relatively new doll, my Mother would sit in the floor with my sister and I and play Barbie dolls with us. We didn't have Barbie cars and jeeps and houses back then. So, my sister and I took cereal boxes, and cracker boxes and made Barbie cars (I was favorable to her Cadillac, which a cornflake box made such a nice one!) My sister had Barbie drive a van. Her van was made from a saltine cracker box. Barbie sometimes had a pull camper, which we fashioned from a large oatmeal can. Tins from vegetables were washed and turned upside down, and Barbie had chairs. Mom bought a bag of Barbie shoes for us once. And then sat for days cutting out and sewing together whole wardrobes for Barbie! She even made Barbie handbags to match her outfits! She once took an apple crate, and divided it up into "rooms", and papered every room with a different fabric for wallpaper. And then handmade Barbie furniture! Yep, we had a Barbie house well before Mattel ever thought of it! And my Mother loved to play jacks with us. Did you ever play jacks? I have such short fat hands, even today, that I am lousy at the game. But I have tried. I don't think I ever could get past fivesies. Mother on the other hand had long slender fingers, and she could scoop up 12 or more jacks at a time! She was the best at it! I did get to be pretty good with pick-up-sticks. Do you remember those? They were great for hand/eye coordination! Oh, I wish I had pictures of my Mother doing all these things with us! I remember one Easter Sunday that started out warm and beautiful. And after church, Mother had made a picnic lunch and we were going to go to the Azalea Gardens and have a picnic and walk the miles of trails. Azaleas were already in bloom, and this had become our yearly thing to do. Well, as we were driving the short couple of miles to the garden, the wind began to pick up. And by the time we arrived, it wasn't only windy, but raining cats and dogs as well! Mother turned from the front seat and looked back at me,'Scoot over Sissy, we're all climbing in the back seat for our picnic!' Without missing a beat, my Mother climbed over the front seat, spread out the picnic blanket and began to open up our lunch basket. We played 'I Spy" and sang songs until the windows were completely fogged up! It was the best picnic I can remember as a child! I later had a picnic with my husband which was just as exciting. It was Father's Day and I wanted to do something fun. So we were going to go on a hike and then eat a picnic lunch in the state park. It could have been a disaster except for his quick wits, and fun loving self. We decided to eat first. Every picnic table in the park was in use! So, we climbed down the embankment and sat on the river bank and ate. It was all very romantic and sweet! Then he carried our belongings back to car, and we started out on a hike. Just a short 4 mile hike. We were almost a quarter of the way through a long climb, and I was in front, when the ground suddenly fell away from beneath my feet. It was nearly 100-feet to the rocky bottom below us. Somehow I managed to get turned toward the face of the cliff, and got my toes and fingers dug into the shale enough to prevent me from falling any farther than I had. I was about 10-feet below the path. I was scared to death! But he was Mr. Cool. He was on his belly, and was leaning way over the edge and holding onto the back of my pants at the waist! 'Climb!' he commanded. 'Come on and climb! You can do it!' And I did. Because of him I was shaken, but I was unhurt. (You would think in a park as crowded as it had been, there would have been someone who would have come around about then! But nope, we were totally isolated there!) Still, it is one of my favorite picnics with my hubby! Maybe because he was/is my hero! And my Mother was my hero! Always there to help me. Always there to make me smile. To make me laugh. And to love me. This Easter will be my second without her. She went to Heaven in July 2015. I look forward to it. But it will never be the same without her there. I still miss her Easter Bunny baskets. And her Easter ham. And I miss hearing her tell why we celebrate Easter every year. She would read the crucifixion with such sorrow. And then she would read the Resurrection. Her voice became 'jubilant'. That's the only way to describe it! And she loved to hear me sing the Jamie Wilson version of 'Ain't No Grave Can Hold My Body Down'. Getting closer and closer to that Trumpet Sound Mama! I miss you! In following my Great-Grandmother's family I am taken back to a particular woman in the 12th-13th centuries. For lack of surname she is known as Isabella of Angouleme. "Isabella of Angoulême (French: Isabelle d'Angoulême, IPA: [izab?l d?~gul?m]; c. 1188 - 4 June 1246) was queen consort of England as the second wife of King John from 1200 until John's death in 1216. She was also suo jure Countess of Angoulême from 1202 until 1246. She had five children by the king, including his heir, later Henry III. In 1220, Isabella married Hugh X of Lusignan, Count of La Marche, by whom she had another nine children. Some of her contemporaries, as well as later writers, claim that Isabella formed a conspiracy against King Louis IX of France in 1241, after being publicly snubbed by his mother, Blanche of Castile for whom she had a deep-seated hatred. In 1244, after the plot had failed, Isabella was accused of attempting to poison the king. To avoid arrest, she sought refuge in Fontevraud Abbey where she died two years later, but none of this can be confirmed. Isabella became Countess of Angoulême in her own right on 16 June 1202, by which time she was already queen of England. Her marriage to King John took place on 24 August 1200, in Angoulême, a year after he annulled his first marriage to Isabel of Gloucester. She was crowned queen in an elaborate ceremony on 8 October at Westminster Abbey in London. Isabella was originally betrothed to Hugh IX le Brun, Count of Lusignan, son of the then Count of La Marche. As a result of John's temerity in taking her as his second wife, King Philip II of France confiscated all of their French lands, and armed conflict ensued. 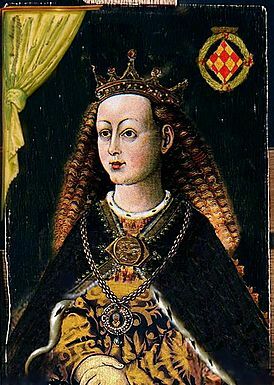 At the time of her marriage to John, the blonde and blue-eyed 12-year-old Isabella was already renowned by some for her beauty and has sometimes been called the Helen of the Middle Ages by historians. Isabella was much younger than her husband and possessed a volatile temper similar to his own. King John was infatuated with his young, beautiful wife; however, his acquisition of her had as much, if not more, to do with spiting his enemies, than romantic love. She was already engaged to Hugh IX le Brun, when she was taken by John. It had been said that he neglected his state affairs to spend time with Isabella, often remaining in bed with her until noon. 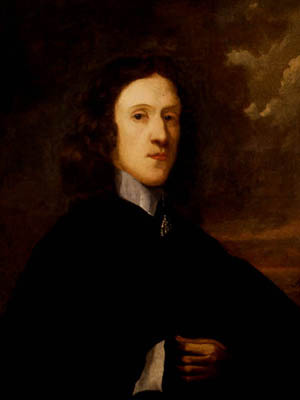 However, these were rumors, ignited by John's enemies to discredit him as being a weak and grossly irresponsible ruler. Given that at the time they were made John was engaging in a desperate war with King Phillip of France to hold on to the remaining Plantagenet dukedoms. The common people began to term her a "siren" or "Messalina", which spoke volumes as to common opinion . Her mother-in-law, Eleanor of Aquitaine readily accepted her as John's wife. In the spring of 1220, she married Hugh X of Lusignan, "le Brun", Seigneur de Luisignan, Count of La Marche, the son of her former fiancé, Hugh IX, to whom she had been betrothed before her marriage to King John. It had been previously arranged that her eldest daughter Joan should marry Hugh, and the little girl was being brought up at the Lusignan court in preparation for her marriage. Hugh, however, upon seeing Isabella, whose beauty had not diminished, preferred the girl's mother. Princess Joan was provided with another husband, King Alexander II of Scotland, whom she wed in 1221. Isabella had married Hugh without the consent of the king's council in England, as was required of a queen dowager. That council had the power not only to assign to her any subsequent husband, but to decide whether she should be allowed to remarry at all. That Isabella flouted its authority moved the council to confiscate her dower lands and to stop the payment of her pension. Isabella and her husband retaliated by threatening to keep Princess Joan, who had been promised in marriage to the King of Scotland, in France. The council first responded by sending furious letters to the Pope, signed in the name of young King Henry, urging him to excommunicate Isabella and her husband, but then decided to come to terms with Isabella, to avoid conflict with the Scottish king, who was eager to receive his bride. Isabella was granted the stannaries in Devon, and the revenue of Aylesbury for a period of four years, in compensation for her confiscated dower lands in Normandy, as well as the £3,000 arrears for her pension. King Henry III of England (1 October 1207 - 16 November 1272). Married Eleanor of Provence, by whom he had issue, including his heir, King Edward I of England. Richard, Earl of Cornwall and King of the Romans (5 January 1209 - 2 April 1272). Married firstly Isabel Marshal, secondly Sanchia of Provence, and thirdly Beatrice of Falkenburg. Had issue. Joan (22 July 1210 - 1238), the wife of King Alexander II of Scotland. Her marriage was childless. Isabella (1214-1241), the wife of Emperor Frederick II, by whom she had issue. Eleanor (1215-1275), who would marry firstly William Marshal, 2nd Earl of Pembroke; and secondly Simon de Montfort, 6th Earl of Leicester, by whom she had issue. Hugh XI of Lusignan (1221-1250), Count of La Marche and Count of Angoulême. Married Yolande de Dreux, Countess of Penthièvre and of Porhoet, by whom he had issue. Agnès de Lusignan (1223-1269). Married William II de Chauvigny (d. 1270), and had issue. Alice of Lusignan (1224 - 9 February 1256). 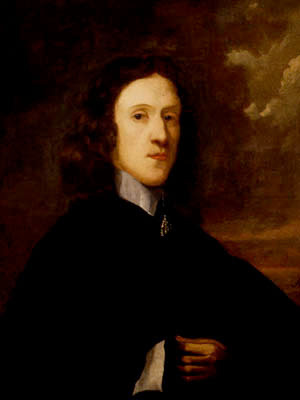 Married John de Warenne, 6th Earl of Surrey, by whom she had issue. Guy of Lusignan (c. 1225 - 1264), killed at the Battle of Lewes. (Tufton Beamish maintains that he escaped to France after the Battle of Lewes and died there in 1269). Geoffrey of Lusignan (c. 1226 - 1274). Married in 1259 Jeanne, Viscountess of Châtellerault, by whom he had issue. Isabella of Lusignan (c.1226/1227 - 14 January 1299). Married firstly before 1244 Maurice IV, seigneur de Craon (1224-1250), by whom she had issue; she married secondly, Geoffrey de Rancon. William of Lusignan (c. 1228 - 1296). 1st Earl of Pembroke. Married Joan de Munchensi, by whom he had issue. She was played by actress Zena Walker in the TV series The Adventures of Robin Hood episode "Isabella" (1956), before her marriage to John, but not as a 12-year-old. She was portrayed by actress Victoria Abril in the 1976 film Robin and Marian. She was played by actress Cory Pulman in the episode "The Pretender" (1986) of the TV series Robin of Sherwood. She was portrayed by actress Léa Seydoux in the 2010 film Robin Hood." What you will not read in Wikipedia is that she is my 17th Great-Grandmother. 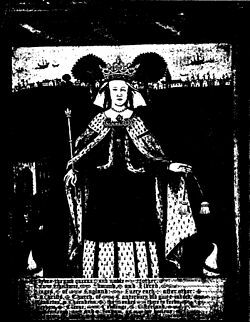 While not the best copy, it is all that I have been able to locate so far of my 35th great-grandmother, Queen Eadgifu. "Eadgifu of Kent (also Edgiva or Ediva) (in or before 903 - in or after 966) was the third wife of Edward the Elder, King of the Anglo-Saxons. Eadgifu was the daughter of Sigehelm, Ealdorman of Kent, who died at the Battle of the Holme in 902. She became the mother of two sons, Edmund I of England, later King Edmund I, and Eadred of England, later King Eadred, and two daughters, Saint Eadburh of Winchester and Eadgifu. She survived Edward by many years, dying in the reign of her grandson Edgar. According to a narrative written in the early 960s, her father had given Cooling in Kent to a man called Goda as security for a loan. She claimed that her father had repaid the loan and left the land to her, but Goda denied receiving payment and refused to surrender the land. She got possession of Cooling six years after her father's death, when her friends persuaded King Edward to threaten to dispossess Goda of his property unless he gave up the estate. Edward later declared Goda's lands forfeit and gave the charters to Eadgifu, but she returned most of the estates to Goda, although retained the charters. Some time after this her marriage to Edward took place. After his death King Æthelstan required Eadgifu to return the charters to Goda, perhaps because the king was on bad terms with his stepmother. She disappeared from court during the reign of her step-son, King Æthelstan, but she was prominent and influential during the reign of her two sons. As queen dowager, her position seem to have been higher than that of her daughter-in-law; In a Kentish charter datable between 942 and 944, her daughter-in-law Ælfgifu of Shaftesbury subscribes herself as the king's concubine (concubina regis), with a place assigned to her between the bishops and ealdormen. By comparison, Eadgifu subscribes higher up in the witness list as mater regis, after her sons Edmund and Eadred but before the archbishops and bishops. Following the death of her younger son Eadred in 955, she was deprived of her lands by her eldest grandson, King Eadwig, perhaps because she took the side of his younger brother, Edgar, in the struggle between them. When Edgar succeeded on Eadwig's death in 959 she recovered some lands and received generous gifts from her grandson, but she never returned to her prominent position at court. She is last recorded as a witness to a charter in 966. She was known as a supporter of saintly churchmen and a benefactor of churches." She must have been made of stern stuff! No back seat driving for her! She took the wheel and drove like a mad woman! I am descended through her son, Edward the Elder, who became King of England, and his wife, Aelfgifu. ****DID YOU GUESS THE ANSWER FROM THOSE PLACES THURSDAY? If you guess the Jamestown Settlement Church, you are correct! 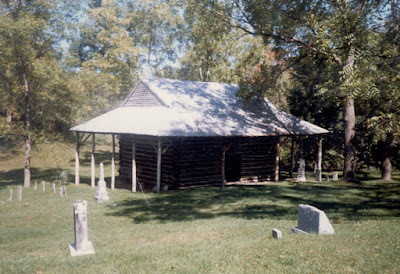 You can visit the reconstructed church today. It was built in 1907, re-using the original bell tower of the first brick church which was erected in the 1640's. This photograph was taken from an old postcard I had purchased back in the 1960's. The photograph was taken probably 40 years before that! And before this place was rebuilt. There are several graves inside this building, including two of my 8x great grandparents. Can you guess where this is located? Be sure to come back tomorrow and see if you were correct! For most of my growing years, thee was only me and my little sister, Eydie. It wasn't until I was married that my little brothers came along. So, when I think of childhood, this is the photograph that comes to mind. That's me on the left, Mommy, and Eydie in her lap. 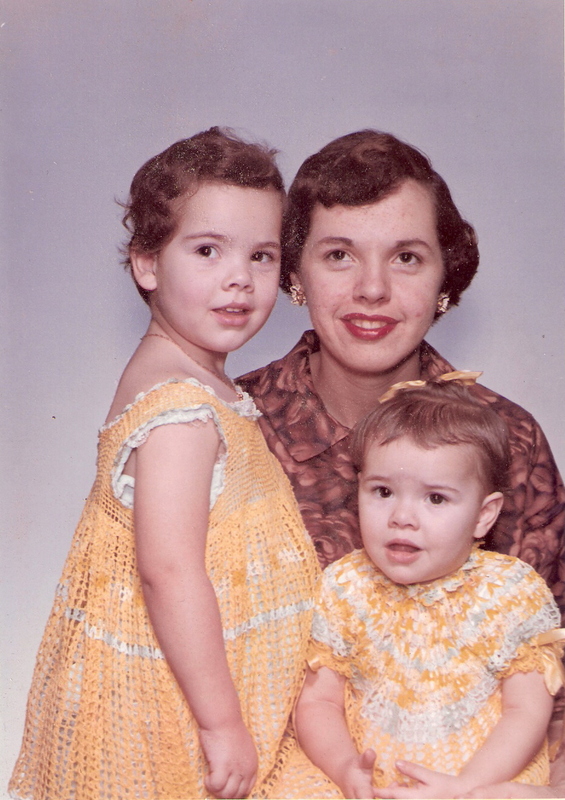 Grandma Dreher crocheted the little dresses we were wearing, and Mommy sewed the pretty skirt suit she was wearing. My Mommy was such a pretty thing! And look at Eydie! I always thought she was my personal doll baby! Although we're 22 months apart, she put up with me playing dress up with her! I used to dress her up in whatever I could find to put on her! Daddy was gone at sea a lot. So my family memories have more to do with the three of us as I was little. Eydie and I were the little girls who put "girl smell" all over Daddy's pillow so that when he came home, he'd remember how we smelled and not forget us when he had to leave again! It was a treasured childhood. And I had the bestest little sister in the whole wide world! Love you Sis!